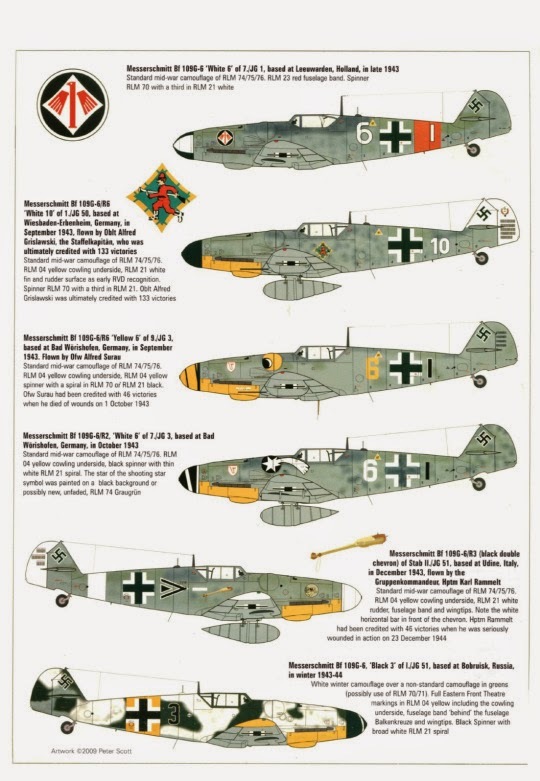 In an attempt to standardize the equipment of the frontline force, Messerschmitt began production of the Bf 109G-6 in February 1943, and this model included many of these previously ad hoc additions. The G-6 would ultimately prove to be the most important variant of Messerschmitt’s famous fighter, with 12,000+ examples being built – more than a third of the overall production run for the Bf 109. Unfortunately, the continual addition of weighty items like underwing cannon gondolas, rocket tubes and larger engines to the once slight airframe of the Bf 109 eliminated much of the fighter’s once legendary maneuverability, and instead served to emphasize the aircraft’s poor slow-speed performance, tricky lateral control and ground handling. 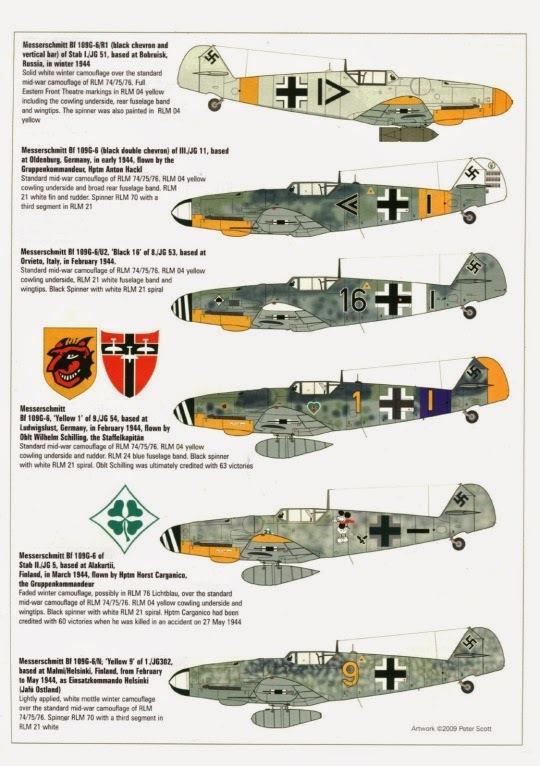 The unpressurized Bf 109G-6 to frontline units from February 1943. In their initial form, they only differed from the G-3/4 in having cowling-mounted MG 131 13mm machine guns rather than MG 17 7.9mm weapons. The large breech blocks associated with the MG 131 could only be housed by modifying the upper fuselage engine cowlings to incorporate distinctive beulen (boils) that in turn came to symbolize all late war Bf 109Gs. The Bf 109G-6 was built in staggering numbers, with more than 12,000 examples rolling off production lines between the late autumn of 1942 and June 1944. Built as the first “standard” model “Gustav” that was intended from the outset to accept any of the ever-increasing number of Rüstsatze sets emanating from Messerschmitt, the G-6 was also capable of being powered by several versions of the DB 605A – the uprated DB 605D was also made available from January 1944. The G-6 was also the first “Gustav” variant capable of carrying the engine-mounted MK 108 cannon. However, production of this awesome 30mm weapon was delayed to the extent that a considerable number of G-6s were built with the MG 151 fitted instead. As with the G-5, the Rüstsatze sets available for the G-6 followed the R designation pattern put in place with the G-l/2. The only real changes unique to this variant centered on the late (1944) R2 set, which covered the fitment of a single WGr 21 mortar launcher beneath each wing. Numerous Umrlist-Bauzatze modifications were to feature, however, starting with the U2 that saw the fighter fitted with a GM I-boosted engine and a wooden tailplane similar to that used by the G-5/U2. The U4 saw the MK 108 replace the MG 151, while the U5 had underwing MK 108s instead of the 20mm cannon. The U6 was similarly armed, but also had the engine-mounted MG 151 replaced with aMK 108 too. Various G-6s had clear vision Eda Haube hoods fitted in the field in place of the conventional framed canopy. Finally, the Bf 109G-6/AS was powered by the DB 605AS engine, and like the G-5/AS, it had a supercharger bulge rather than MG 131 beulen.